A few months ago during the forced absence from my Serie A-reporting “duties”, I thought I’d finally have the opportunity to get a few affairs in order. Namely on the delivery of promises I made a while back and kept from fulfilling for a little too long. One of these was to write a website review of my friend Tim Doel’s Football Italiano. Unfortunately as has often been the case lately, holiday festivities / my own laziness / family drama / global recession / Juventus losses stuff got in the way. Until NOW!! This is the time to right the wrongs of my past for frak’s sake (notice the not-too-subtle BSG reference here), so after a very long wait, here goes. Presenting to you: Football Italiano. I came across Football Italiano some while back in September 2008, when Tim wrote to me asking for a reciprocal link exchange between our two sites. When I first started blogging back in July 2007, I did my fair share of preliminary research on what other sites/blogs were covering the Italian Serie A. Tim’s website must have slipped through the cracks, because until I received his email I had never come across Football italiano before (although in my defense, it was created pretty much at the same time as mCalcio). Anyways, I was pleasantly surprised at discovering a new site dedicated to all things Calcio, and a seemingly good one at that. Football Italiano presents itself as a site “supplying news, opinion and information on Italian football“. 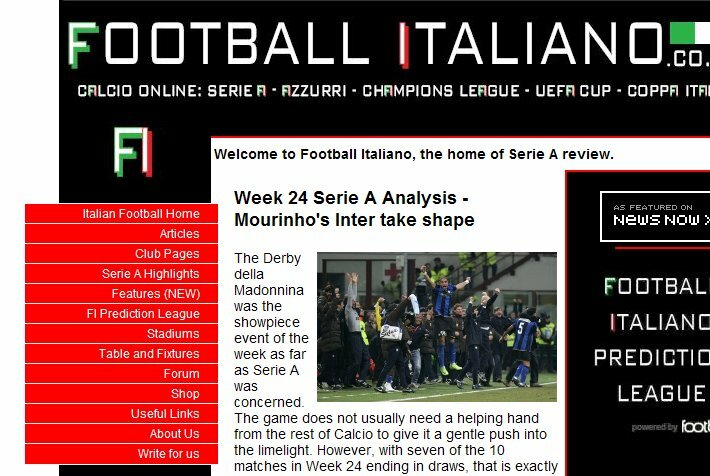 Created in the Summer of 2007, it underwent a brief name change to ItalyCalcio before eventually changing back to its definitive form FootballItaliano.co.uk. Essentially, it’s a website made BY UK fans FOR UK fans of the Italian beautiful game: it targets the British demographic of Serie A fans, aiming to contribute to the popularity of Italian Football across the Channel. 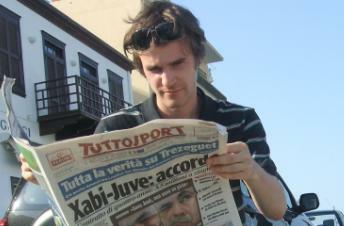 The main man behind Football Italiano is its founder and editor, Tim Doel. Tim fares from High Wycombe (a large town about 50km North-West of London) where he obtained a degree in Politics. In spite of his British origins however, Tim describes himself as a “full italophile“: he loves all things Italian ranging from food to football and is a fluent speaker of Dante Alighieri’s language. A fluency which should definitely come in hand as Tim currently resides in Milan, getting his daily fix of Gazzetta dello Sport infos and keeping the site up-to-date with what is happening in the Peninsula. Completing the team of Football Italiano are Tim’s collaborators, aka Rob Paton (Deputy-Editor and Communications), “Puds” (Brand Manager), and Ashley Micklewright (site designer). These are the four lads that started it all, and even though they have now gone their separate ways (with the exception of Rob) the website’s author-list has since then expanded to include several guest-writers & contributors. Although not a traditional blog per say, Football Italiano’s main page features its articles arranged in reverse chronological order. In other words a “latest news” format. In addition to that, the website also has features a few interesting dedicated pages, such as Club Pages (for each Serie A club, with a brief club description and their latest ingoing & outgoing transfers), Stadiums (similar as Club Pages with a descrition of all big Serie A stadiums), Serie A Highlights (a single page with YouTube embedded highlights of the latest Serie A round). Every week Football Italiano brings you a translation of one of la Gazzetta dello Sport’s interviews with a major name from the world of Italian football. We don’t give you interpretations, nor comments, just interviews straight from the Peninsula to read over your morning coffee. The latest featured Fiorentina president Diego Della Valle. Each week Tim mixes tales of his experiences of living in Italy with comments on the past week’s major talking points whilst also looking ahead to the coming weekend’s biggest games. Here’s his Matchday 24 analysis. The world’s greatest players past and present to have graced Italy’s top league get the special treatment in this new regular feature. Football Italiano dissects a player’s game to show you exactly what makes Serie A’s best a cut above the rest. Recently featured Pavel Nedved, Diego Maradona and Roberto Baggio. 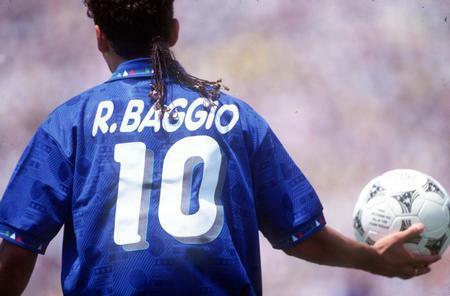 Finally, for the compulsive buyer in all of us (and as a nice way to supplement his income), Tim has set up an affiliate shop with Amazon.co.uk, filled with Serie A jerseys, shorts, balls, books, and goodies of all sorts and colours. What really distinguishes Football Italiano from the other blogs is the unique thoughts & insights of a Britain-based Serie A lover. Although he now lives in Milan, Tim’s main articles very often tackle the popularity of Italian football in the UK compared to the EPL and other leagues, as well as the history of TV coverage and comparisons to how it’s done in the Italian peninsula. Conclusion: if you want to expand your quality Serie A-reading horizons, make sure to stop by Football Italiano and say hi to Tim for me. This entry was posted on Friday, February 20th, 2009 at 10:02 pm	and is filed under Miscellaneous, Serie A, Sponsors. You can follow any responses to this entry through the RSS 2.0 feed. Both comments and pings are currently closed.